With storage space in our RVs at a premium and we cant afford to lug around large appliances that only get used periodically. The bulky upright vacuum may be fine at home where you have plentiful utility closets and thousands of square feet of carpet but they arent so practical when you live in a 350 square foot motorhome or travel trailer and are on the move. This is why more and more RV owners are installing RV central vacuum systems and ditching the uprights and anemic handheld vacs. 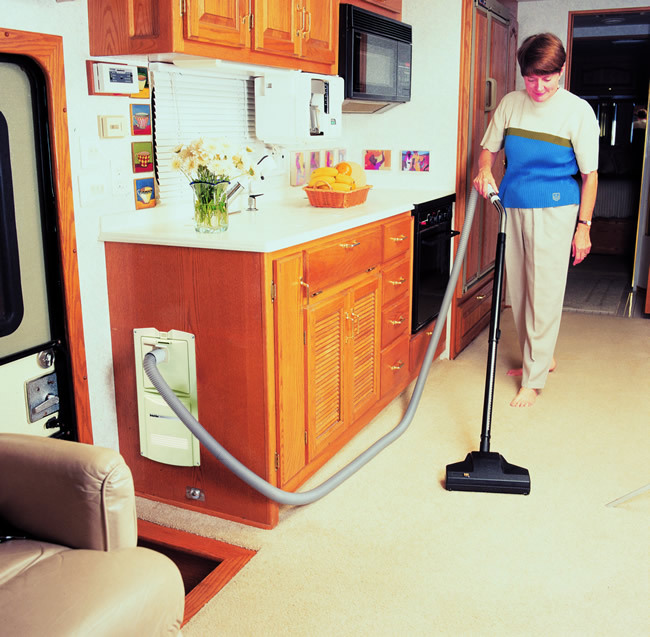 It doesnt matter whether your RV is a new motor coach or an older fifth wheel, theres an easy to install central vacuum system for you. There are 3 major brands of RV central vacuum systems available. All 3 offer remote operation so the vacuum unit can be installed in a separate location such as an underneath storage compartment of a motor coach. 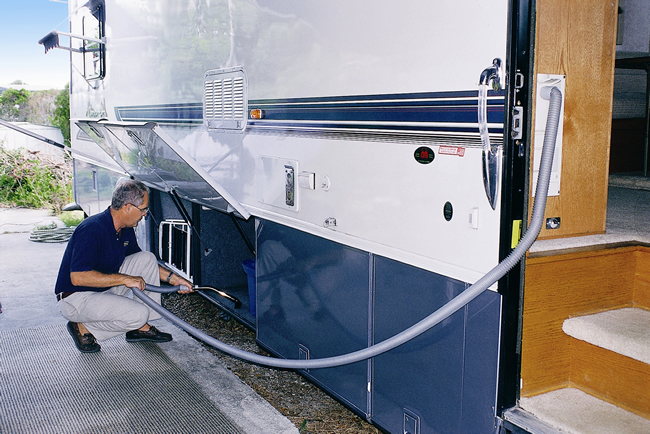 In this case the vacuum is started by inserting the hose into the remote inlet valve located in the RV's living space. For those who want a simpler installation or dont have the space available below, InterVac is the only manufacturer who also offers flush mount and surface mount options. With these units the hose is plugged into the front of the vacuum unit and turned on with a switch. InterVac is also the only brand whose vacuum is manufactured in the U.S.A.
For those with allergies or breathing disorders, eliminating the pollen and dust with hepa filtration is vital. Hepa (High Efficiency Particulate Arresting) filters use multiple layers of finely woven fabric to capture 99.7% of all particles at the .3 micron size. To put that in perspective, the average human hair is between 50 and 150 microns. Another advantage of the bag filter is that less dirt and debris gets returned to the air when emptying the vacuum because of the sealed bag. 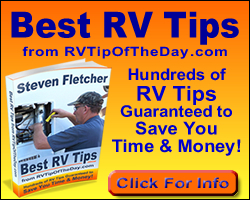 Besides making the routine chore of cleaning your road home easier, adding a RV central vacuum system can increase the resale value of your RV. Electrical power is another important consideration when planning a central vacuum installation. While they can be run off of a 1500 Watt or larger inverter, this should only be done for brief periods because of the large current being drawn from the batteries. If you are hard wiring the vacuum, its necessary to ensure there is breaker between the unit and the power supply. Also, with the remote start units you will need to run wire for the low voltage (usually 24V DC) supply between the vacuum and the remote inlet valve. All of the RV central vacuum systems now use stretch hoses for easier storage compared to the traditional crush-proof central vacuum hoses. The hose stretches to a length of 30 for the Eureka, 35 for the Dirt Devil, and 40 on the InterVac. By retracting to a length of 8 feet, these hoses remain manageable and much easier to stow. Whether youre a full timer or part timer, you can save space, add value, and make cleaning easier by installing a central vacuum system in your motorhome, fifth wheel or travel trailer.